The types of Cookies described above may be „session Cookies“ which are temporary Cookies that are only stored on your device while you are visiting our site or „persistent Cookies“ which are Cookies that are stored on your device for a period of time after you leave our site. The length of time a persistent Cookie stays on your device varies from Cookie to Cookie. We use persistent Cookies to store your preferences so that they are available for the next visit, and to keep a more accurate account of how often you visit our Services, how often you return, how your use of the Services may vary over time, and measure the effectiveness of advertising efforts. Through these Cookies, we may collect information about your online activity after you leave our Services. Just like any other usage information we collect, this information allows us to improve the Services and customize your online experience. 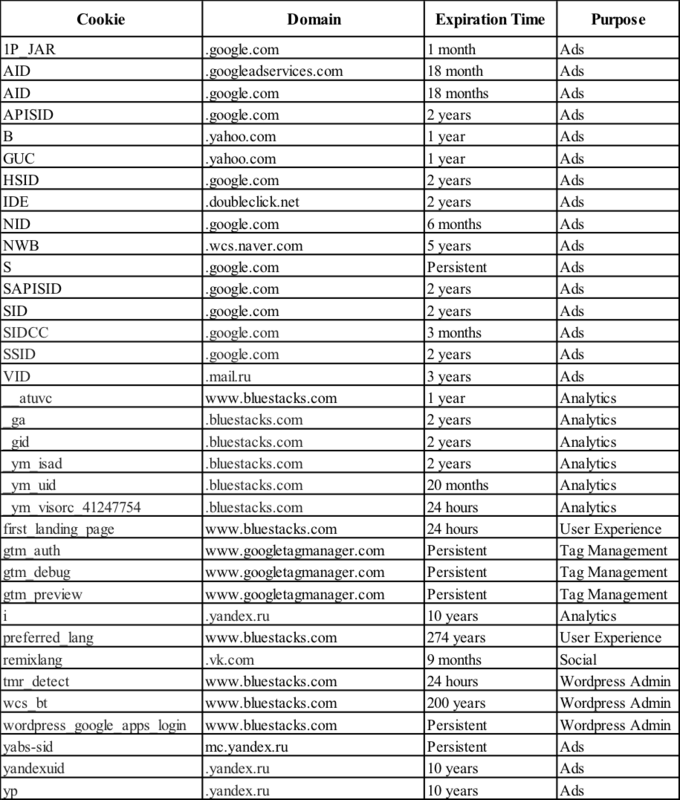 Your browser may offer you a “Do Not Track” option, which allows you to signal to operators of websites and web applications and services (including behavioral advertising services) that you do not wish such operators to track certain of your online activities over time and across different websites. Our Services do not support DO Not Track requests at this time, which means that we collect information about your online activity both while you are using the Services and after you leave the Services. Our Services use Google Analytics, a web analysis service provided by Google Inc. („Google“) which is based on Cookie technology. The information generated by the Cookie is usually sent to a Google server in the USA, where it is stored. On behalf of BlueStacks, Google will use the generated information to evaluate your use of the website, to compile reports on website activities, and to provide the website operator with additional services connected with website and Internet use. The IP address transmitted by your browser in connection with Google Analytics is not collated with other data by Google. To opt out of being tracked by Google Analytics across all websites visit http://tools.google.com/dlpage/gaoptout. To explore what Cookie setting are available to you, look in the „preferences“ or „options“ section of your browser’s menu.